Hungary nestles at the geographical epicentre of the EU, yet many people still only know very little about this enchanting country. Many years ago, Hungary’s borders defended a vast landmass and Hungary has, over the years had its boundaries diminish, be re-drawn and redefined mainly due to invasion and war. A communist country until relatively recently, Hungary shares borders with countries that include Austria, the Ukraine, Slovakia and Croatia. Hungary is a fiercely proud country that maintains its traditions and culture. Budapest, or more correctly the 2 cities of Buda and Pest that occupy opposing banks of The Danube, is a cosmopolitan and most charming city that has undergone significant regeneration in recent decades. Where once there were broken roads now lie beautiful cobble and slate streets. Where once ominous dark buildings, blackened by traffic and grime, soared skywards, newly cleaned architecture now proudly stands, ranking amongst some of Europe’s finest. Soaking up the grand sights takes time; there is so much to see. From the Gothic Cathedrals, Heroes Square and the hugely impressive open air Spa. From Art Nouveau, classic and Neo Classic styles through Gothic, Ottoman and Renaissance, the architectural tourist is spoilt rotten in Budapest. The 2 banks of The Danube at Budapest are connected by a number of beautiful historical bridges, the iconic tourist destination being the Chain Bridge – famously guarded at each end by a pair of huge lions. Views from Buda Castle, high up on the hillside overlooking the City, are breath-taking. 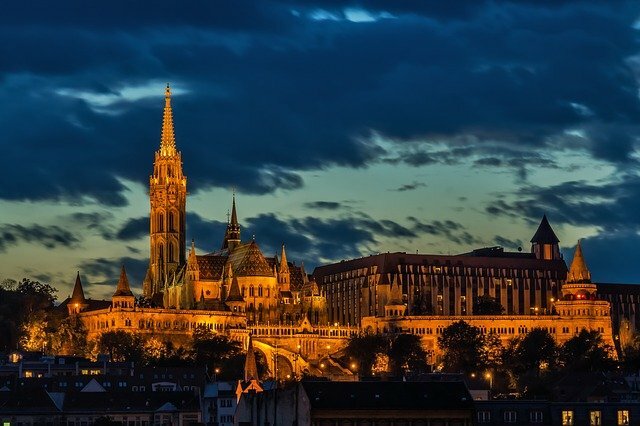 Accessed by road or the hillside Funicular, Hungary’s breathtakingly beautiful Parliament Building and St Istvan Basilica can clearly be seen on the opposite bank of The Danube and are well worth the short journey. The Castle itself has the impressive and imposing mounted statue of Stephen I as its focus, and scattered amongst the medieval architecture are taverns, restaurants and tourist shops. The leafy tree lined streets of Andrassy Ut. host boutiques and cafes and represent the ultimate shopping destination for the well-heeled. A stroll along Andrassy Ut. reveals the magnificent Opera House, home to live classical music and ballets. A little further down Andrassy Ut heading towards Heroes Square is the House of Terror, a museum offering ‘a moving insight into oppressed Hungary’. Atmospheric music accompanies the exhibits of Nazi occupation and latterly the Soviet Occupation of Hungary. Not for the faint hearted, many visitors leave the House of Terror deeply moved. Beyond Heroes Square are the National Zoo and Spa. Budapest boasts one of the most ‘easy access’ zoos in the World, with great close up views of pretty much every animal imaginable. The magnificent open air Szechenyi Baths and Pool opposite is a must-visit, boasting 18 hot water baths, 15 of them fed by warm spring water. The underground network in Budapest, called the Metro, is the oldest electrified underground rail system in mainland Europe – and it shows. Whilst efficient and far reaching, the quaint wooden trams and stylish colourfully tiled stations give a real taste of bygone times. Budapest now has its share of fast food chains, banks and cash points, and Western retailers are starting to infiltrate the high streets. Traditional Hungarian shopping areas still abound, but the Western traveller doesn’t need to look too hard to find some home comforts. Hungary is land-locked and many sea-seeking Hungarians holiday in Croatia. However, for the more dutiful locals, Lake Balaton in Western Hungary offers a vast fresh water lake with a 200km shoreline. There are hotels, shops and water sports to be found, along with miles of undisturbed naturally beautiful tree-lined shores. Almost an institution as a holiday destination, Lake Balaton has been a favourite for hundreds of years. Just over an hour’s drive from Budapest lies the Spa town of Eger. Famous for its mineral-rich natural spas, the beautiful town is a destination both for tourists seeking a relaxing day or two immersed in warm spring waters, and for the health conscious, seeking the proven benefits of Eger’s soothing spring water. Hungarians eat well and enjoy their food. Dining is an event as well as a tradition for the whole family, and many Hungarians dress in their finery to eat at local restaurants at the weekends. Most urban street corners and subway entrances offer a wide variety of snacks including Langos – a delicious sweet fried dough served with cream, garlic sauce or cheese, and fresh sweetcorn, boiled on the cob and eaten by hand. Hungarian restaurants are usually rich in character and Old World style. Many have live music, usually accordion players, the harpsichord and even string quartets accompanying the excellent food. Game, and duck in particular, is very popular, as are the traditional Goulash and Paprikash dishes, served with potatoes or dumplings. Hungarians love their meat stews, many served with large dollops of cream. Krumpli is a favourite creamy layered potato dish, and cabbage sides are also very popular, stuffed or pickled. 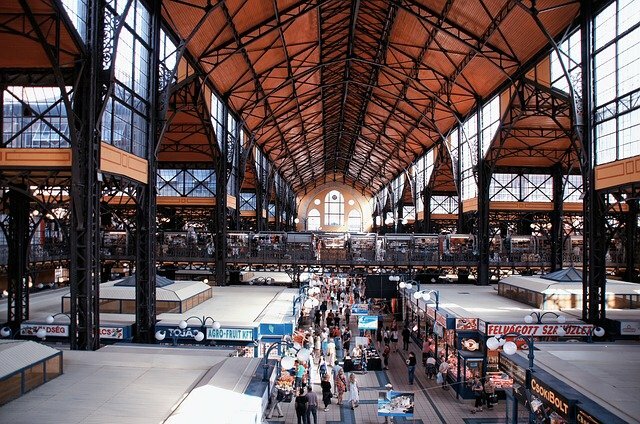 Hungarians compete with the Germans in their love of sausage, and every Deli boasts a huge selection of tastes and styles: tomato, garlic, boar, apple and herbs to name but a few, to be eaten in dishes cooked at home, or as fast food with a local delicious bread. Pudding-lovers are very well catered for, with layered cakes, sweet soft cheesecakes, crepes and trifles available pretty much everywhere. Suffice to say, traditional Hungarian food may not be the healthiest in the world, but it is certainly amongst the tastiest. Many small local town restaurants would win national awards for their quality and taste, and prices are generally very reasonable. Hungary is becoming very well respected for its viticulture. The most famous Hungarian grape variety is the sweet Tokaj from the northeast of the country. Cake shops and restaurants abound in all Hungarian towns and cities and a glass of deliciously sweet Tokaj is recommended with any local sweet treats. Eger, a 2 hour drive from Budapest, is well known for both its spas and its grapes – Egri Bikaver being the original ‘Bulls Blood’ wine known to many wine lovers worldwide. Hungary has its own unique local grape varieties and wine quality is increasing exponentially. A wine tasting event in Hungary will certainly introduce you to a large variety of previously un-encountered grapes and some really fine wines to the discerning palette. Pálinka is a ‘must try’ for anyone visiting Hungary. A local fruit brandy, in varying strengths and qualities, it is a much quaffed treat. ‘Pálinka in small amounts is a medicine, in large amounts a remedy’, the Hungarians say. A slightly more dangerous offering is Unicum, a Hungarian national drink. Its bitter and herbal flavour does not suit everyone, and is definitely an acquired taste, but that doesn’t dent its huge popularity in Hungary, either as an aperitif or digestif, and it has to be tried. Hungarians follow similar etiquette to many Europeans. A handshake is a normal greeting, but gentlemen must always wait for a lady to offer her hand first. Eye contact is important, particularly in business dealings – engendering trust. It is still not unusual to see the older generation bowing as a greeting. Formal business dress is preferred, dark suits and white shirts are the norm, and punctuality is of immense importance. Arrive early, ten minutes or so, never late, as this is seriously frowned upon. When dining out it is usual for a number of dishes to be served. It is normal to try them all, and NEVER start eating before the host; this is considered greedy and ill mannered. Politics and business are not considered good table conversation, and tipping is normal in restaurants, between 10% and 15% of the cost of the meal. There is plenty of competitively priced accommodation in Hungary, and in the cities it is possible to get a very affordable 2 or 3 bed apartment in a stylish traditional building. Expat communities are large and easily found, and life should be good if you bear in mind one or two rules and quirks. Alcohol tolerance for driving is zero, and well policed. It’s not worth the risk. Personal safety is good, although there are relatively high rates of property crimes. The Health Service and Dentistry are of very high standards and most customer facing staff speak a little English. As for learning Hungarian, good luck! It is one of the least spoken and most difficult languages to learn in the world. Hungarians prefer face to face meetings in business, and can sometimes appear brutally open and forthright. This is not unusual, and is a part of their openness and their desire to reach deals and conclusions with no grey areas. Personal relationships are an essential part of doing business in Hungary. Opening a personal bank account in Hungary is relatively easy, a passport and proof of address are required, or a residents permit. Opening a business bank account is a little more involved, and you will need to be registered as a business in Hungary. This normally takes the form of a KFT, which is a limited liability corporation. This will require a business address, director’s details and notification to the Hungarian Tax Authorities. Generally, banks are closed on Saturdays, and during the week close at 4pm. The Hungarian tax authorities have draconian power, even including direct control over your business bank account to ensure that taxes are paid on time. This is in contrast to the ‘Black Economy’ in Hungary, where cash is still a common business currency. It can be quite alarming to be offered 2 prices for goods or services, one with Samla [invoice] and one without. Though it would be hard to get an admission, many employees’ wages in Hungary are subsidised with cash, allowing employers to pay minimum wage and lower income tax. Hungary has benefited from significant EU investment over the last 15 years. Some 6% of Hungary’s wealth is generated by EU investment. There is certainly more of a ‘feel good’ factor in Hungary than in previous years, and entrepreneurs are welcomed in the country. The economy is ever improving in Hungary. After many years of depression the Government introduced harsh austerity measures that have made a positive impact. The Hungarian Forint, the National Currency, is more stable than ever, whereas just a few years ago it fluctuated significantly day by day, making business difficult if trading internationally. Hungary is a safe, exciting and welcoming country. The climate is very good, the architecture breath-taking, the people friendly and the opportunities for tourists to keep entertained are immense. There are some exciting regions to explore, and Hungary’s rich history is evident everywhere that you travel in the country. Exchange rates still keep the country relatively inexpensive, business is relatively easy to conduct and the food and wines are varied and delicious. Are you moving to Hungary or looking to conduct business there? We can help with any of your Hungarian translation needs with our language translation services. Contact us for more information today.